Prepare all ingredients- dice, chop, mince! You won't have time to do it as you go! Cook and stir the garlic and shallots in butter until golden brown, taking care not to burn the garlic. 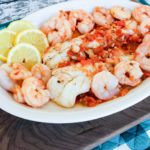 Place the cod and shrimp on the tomato mixture; season with blackening seasoning (or salt if you prefer). Squeeze 1/2 a lemon over fish and shrimp. Cover skillet and simmer 3 minutes. Carefully flip the cod and season again with blackening seasoning (or salt if you prefer) and the juice from 1/2 a lemon; re-cover and cook another 3 minutes.